What comes to mind? Maybe civil rights, gay rights, abortion legality, animal rights, immigration, war, poverty, religious freedom, environmental issues, physics...Wait, did that just say physics?? Most Americans know they shouldn't take their freedom of religion and freedom of the press for granted (even if we still do), but I didn't realize I was taking my ability to study physics for granted until recently. Kinda crazy. Surface level I have to admit that I find it amusing. Pretty amusing actually, although the deeper issue is not quite so funny. According to the Nepal News, the students were protesting because spots in masters-level physics classes are so limited that many who want to take them can't. In addition, it is difficult for students that didn't start in the program to change over to physics. 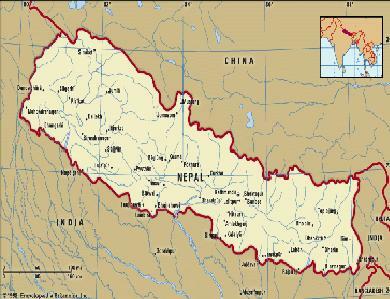 According to a 2004 report on Physics Education in Nepal by the American Physical Society's Forum on Education, many students want to study physics because it can be their ticket out of a politically unstable country. From the report: "Less than 10% of the physics graduates get government jobs inside or outside the Physics field, about 50% choose the teaching profession while the other 40% of them try to go abroad for further studies. Amongst those who seek greener pastures, most than 90% come to the land of opportunity, USA. The students with a degree in physics have better opportunities to go abroad for further studies." Medicine and engineering are the high-paid professions in Nepal, but both are extremely competitive. Some students choose to pursue degrees in physics hoping to cross over into engineering - where the money is - in the future (see Hem Raj Sharma's profile). We haven't been able to find any information on how successful the protestors were at achieving their goals, but I've got to hand it to them - you'd be hard pressed to find a student in the United States protesting lack of availability in a physics class - even if it's filled to the max. 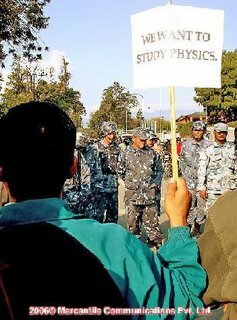 It seems to me (and I fully admit that I'm about as ignorant as them come when it comes to Nepal), it seems to me that any place where students are ambitious enough to protest for the chance to study physics but don't have the opportunity to is in trouble. And I think it goes without saying that anywhere students are willing to study physics in exchange for a ticket out is in trouble as well. I can see it. I've got a Mechanical Engineering degree. I wanted a broad base, and took more math, physics, computer, etc., courses than i needed. I wanted to take a couple electrical engineering courses, but that department made the barrier to entry too high. You had to take all the prerequisites. No exceptions. Fine. One of the courses only required the introductory course, so i signed up for it. On the first day, they passed out a 100 question homework set due two days later. After five problems, it became clear that this could be completed only if i did nothing else. That might have been OK if i was willing to change majors or cheat. I dropped the course, of course. I still don't understand the policy. Now that science is mostly interdisciplinary, it seems absurd. Engineering has always been interdisciplinary. Car engines are mechanical, but have always had electric ignition.